Everyone has dreamed of being a basketball star at some point. Click here to play! For most people, that probably comes after the first time seeing a player soaring through the air to slam dunk the ball in spectacular fashion. There are few moments of sport that can compare with it. 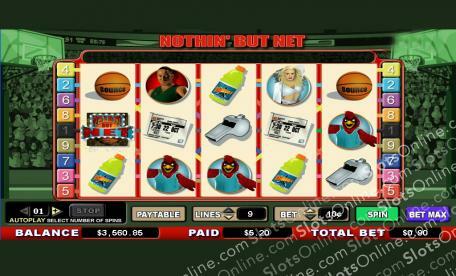 In the Nothin' But Net slots, you are just such a basketball superstar, playing your way to big sponsorship deals and taking your team to victory in every game. The Nothin' But Net slots give you the best teammates, the hottest cheerleaders and the goofiest mascot in the league. Start racking up the points and make a name for yourself in the basketball world, and you'll soon be endorsing sports drinks and sneakers to get paid the big cash. Become a basketball legend without ever having to leave the house in the Nothin' But Net slots, where a slam dunk is a massive jackpot win. The Score Board symbol is the scatter in this game, and it pays out on the total bet when 2 or more land on the reels. The Nothin' But Net Logo symbol is wild. It appears only on reels 1 and 5, it can substitute for any symbol other than the scatter, it doubles the wins of paylines it acts as a substitute on, and it triggers 15 free games at a triple prize multiplier when it lands on both reels 1 and 5 on the same spin. Autospin can be set from 1 to 99 times.